My Outside Voice: Recipe of the Week! My Friend, in Chicago, made in incredible pumpkin layer dip that I am going to try to get the recipe for to post for you later, it is SO good, but in the mean time, here are some fabulous cookies that someone made and brought to the party! Preheat oven to 375 degrees. In a medium bowl, whisk together flour, baking soda, baking powder, pumpkin-pie spice, and salt; set aside. Using an electric mixer, beat together butter and sugar until light and fluffy. Add egg; beat until smooth. With mixer on low speed, alternately add flour mixture in two parts and pumpkin puree in one, beginning and ending with flour mixture; mix just until combined (do not overmix). Drop dough by heaping tablespoons onto two baking sheets, about 1 1/2 inches apart. Bake until puffed and edges are golden, 15 to 20 minutes, rotating sheets once during baking. Immediately transfer cookies to wire racks, and cool completely. 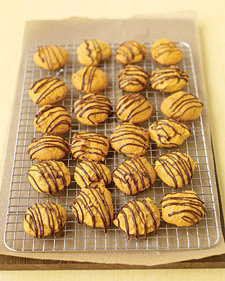 When cookies have cooled, set them (still on rack) over a baking sheet or waxed paper. Place chocolate in a medium heatproof bowl set over (not in) a saucepan of simmering water; stir until almost melted. Remove from heat; stir until completely melted. Pour chocolate into a resealable plastic bag. Snip off a corner with scissors or a knife to make an 1/8-inch hole; pipe chocolate over cookies. Refrigerate until chocolate is firm, about 20 minutes. Makes 3 1/2 dozen. Those were good, thanks for posting the recipe. I saw these in Everyday, they look *so* good! Libby, I personally taste tested these, thumbs up! The cookies you posted I copied as well and I am going to try to make this weekend!